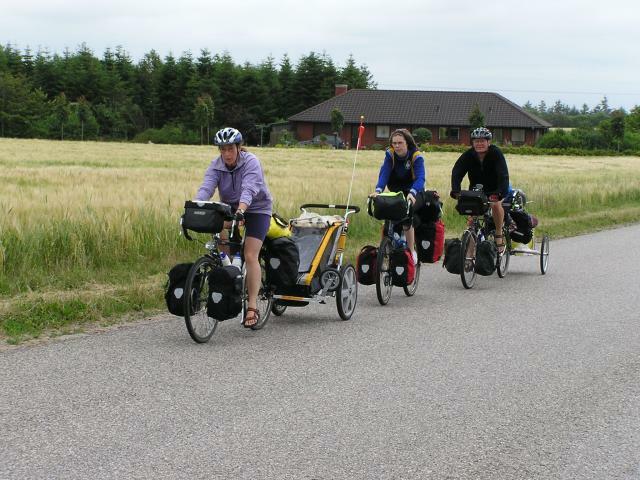 Ceri-Siân and I went cycle camping in the Danmark for almost 3 weeks. 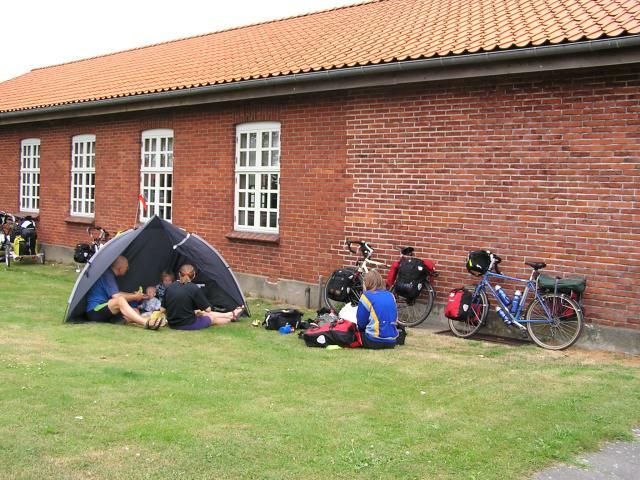 The reason for Danmark - to attend the Tandem Club International Rally at Tommerup Stationsby on the Island of Fyn. 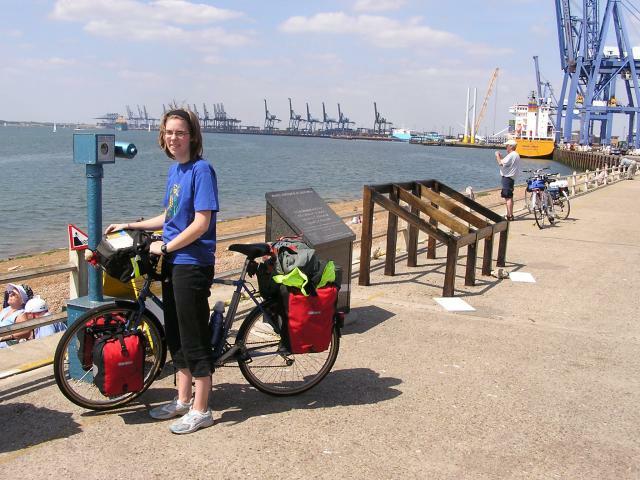 We spent a week cycling there and a week cycling back to Trimley St Martin in Suffolk, where we had left the car. At the the last minute I knocked up a sign for the tent, using the logo for the tandem club rally. 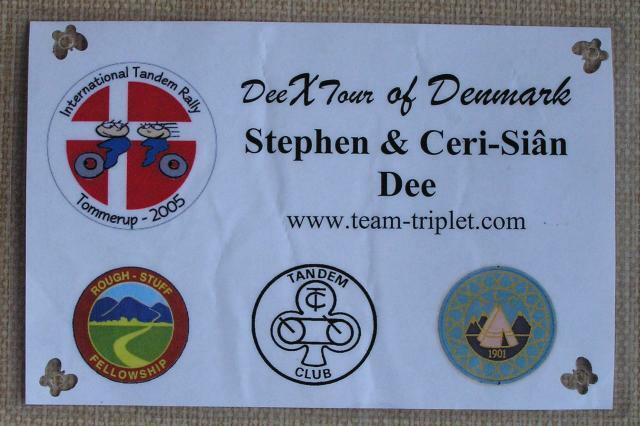 Despite going to the Tandem Club Rally, Ceri-Siân wanted to ride her half bike, hence DeeXTour. Dee Tour as in the roundabout routes we use, and "X" as in our half bikes, my eXp and Ceri's Xtc, and the eXtreme nature of our trip, 3 weeks away without mummy! The bottom row consists of logos of 3 of the organisations Ceri-Siân and I belong to, Rough Stuff Fellowship, The Tandem Club and the Association of Lightweight Campers. 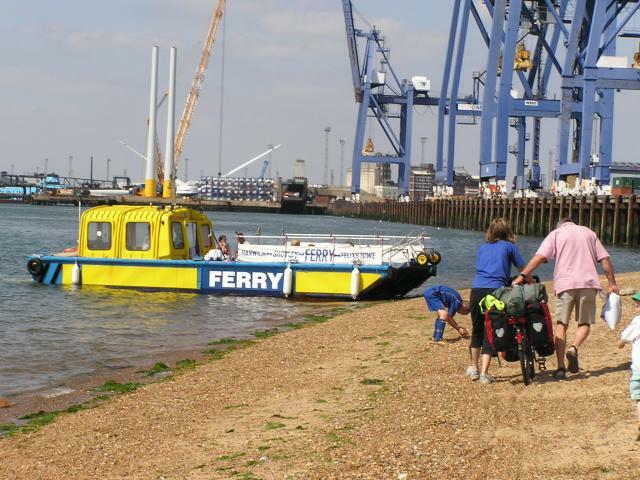 After leaving the car at Trimley St Mary, we rode to Landguard Point, Felixstowe to get the ferry to Harwich. Here is Ceri-Siân waiting for the ferry. The ferry at Felixstowe lands on the beach so we had to wheel the bikes across the shingle. Ceri-Siân is getting assistance from a fellow ferry passenger. The other passengers helped with loading the bags. 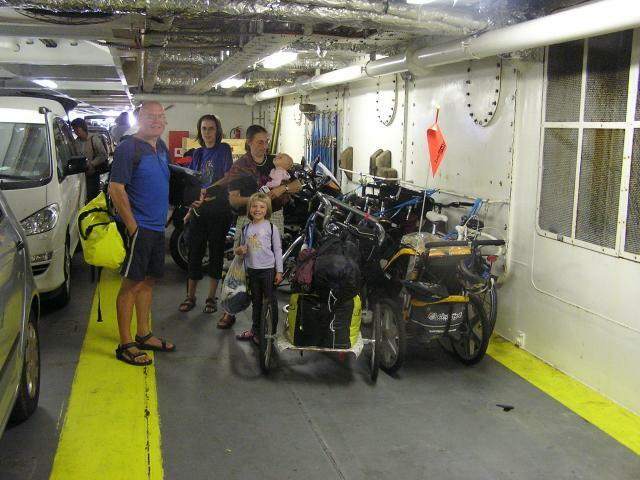 Our bikes were stowed either side of the of the ferry at the front. 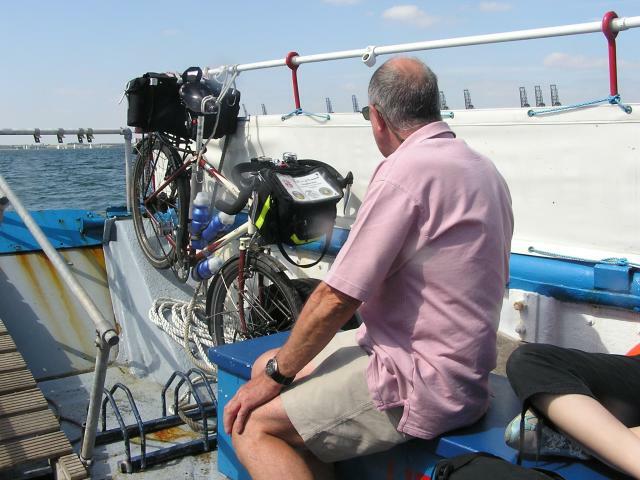 It was a bit choppy going across the Orwell/Stour estuaries and our bikes got a bit wet. From Harwich we got the 18:00 hours sailing abroad the m.s. Dana Sirena to Esbjerg in Danmark. On board the sailing were a few other tandem teams, including the Rowe family, who are seen on the car deck after they had stowed their cycles. Ceri-Siân and I had booked a buffet meal. 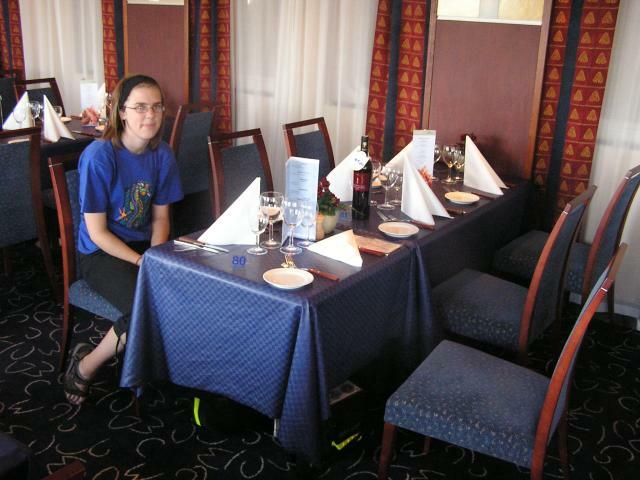 We were advised the only thing to do on the ferry was to eat, drink and sleep, so we got into the restaurant as soon as it opened and took our time enjoying our meal. I gather people like us caused a few problems for those who wanted to eat later! My starter a nice selection of seafood. 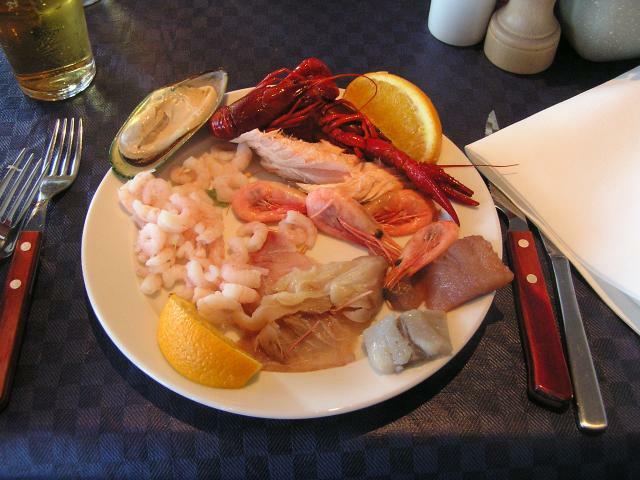 The crayfish and shrimps were nice but hard work. 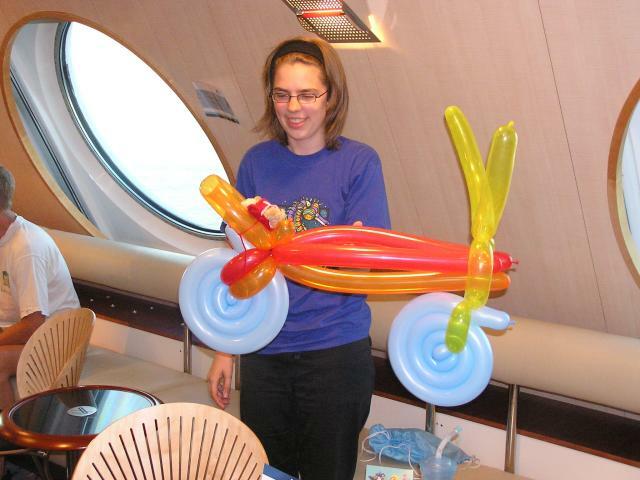 Ceri-Siân made the most of her "Child fare" by getting involved with the children's entertainer, who made her a balloon bike. 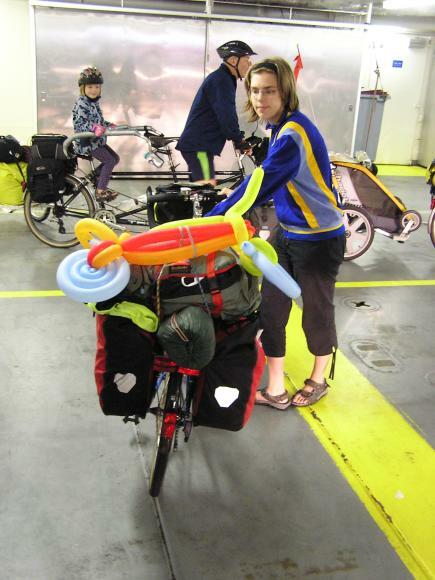 Setting off from the ferry upon arrival at Esbjerg, with her balloon bike strapped on the back. The balloon bike did not survive long in the streets of Esbjerg. We rode with the Rowe family and camped with them for our first night. Ceri had her own tent on the basis she carried it. She took the Hilleberg Nallo 2, which can be seen between her panniers. From Esbjerg we made our way to Bryndum, after good fortune, finding a small supermarket where Lynda and George could get some food. 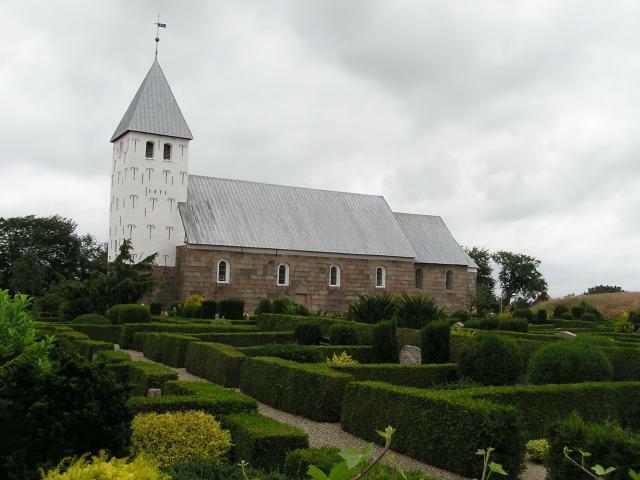 The Church is typical of the style in Danmark. 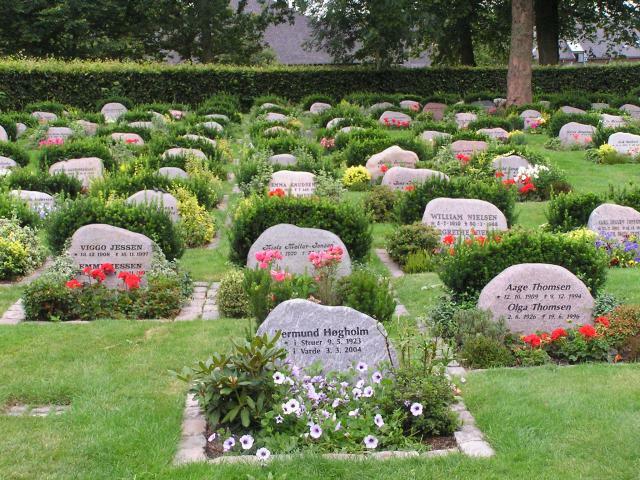 Note that cemetery with hedges around the graves, typical of what we saw across Danmark. On a green opposite the church at Bryndum we stopped for lunch. For protection of little Martha who was 8 months old, Lynda and George pitched a shelter from the sun and wind. Putting the shelter up brought on an attempt at rain! Ceri-Siân riding between Lynda and George Rowe. Martha is in the trailer and Helen out of sight behind her dad on the tandem. 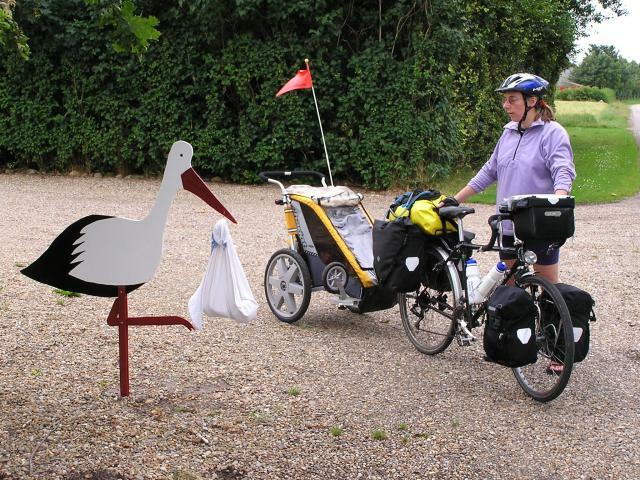 Like we had seen in the Netherlands the arrival of the stork is celebrated, although only by the stork posted at the end of the drive. As we set off after taking the photo, we bumped into proud mum pushing her young baby in the pram. Our first night, and all nights camping , apart from at the tandem rally were at sites listed in "Over natning". This is site 371 at Ǻplads ved Karlsgårdeværket, near Varde. For more information about the camp sites we used, please see our pages on "Over natning". 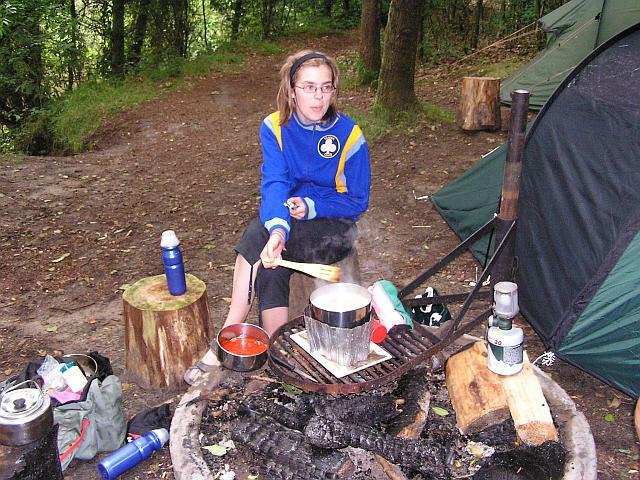 Like in previous years Ceri-Siân was chief cook. The only problem with that is cheese, mushrooms, and other nice foods are off the menu! After our evening meal I left Ceri-Siân home alone at the campsite whilst I went for an evening ride into nearby Varde to phone home. The cemetery at Sct Jacobi Kirke gives a very good picture of the well kept cemeteries with hedges around graves found all over Danmark. 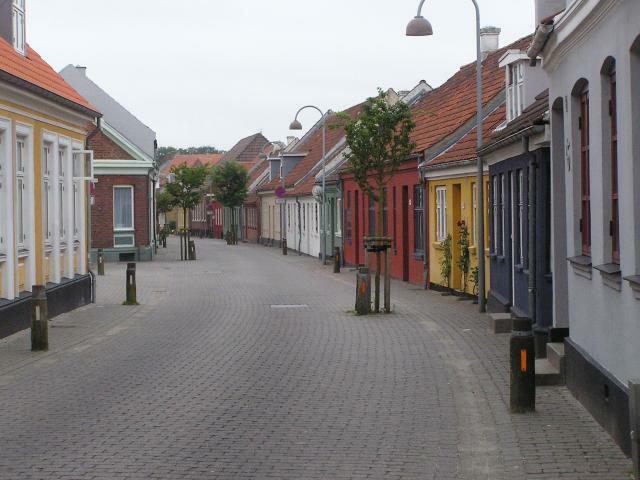 My ride around Varde, although it was a Sunday, evening gave a picture of what we found across much of Danmark. Nice well ordered towns and villages, but nobody at home!